“The ants come marching one by one, hurrah, hurrah!” (Or not! Do we really celebrate the ants when they come in by the dozens, marching through our kitchens and bathrooms, clutching on to crumbs or dog kibble? We don’t think so!) Ants can come in through the tiniest of holes and can be a real nuisance. Home traps purchased from any grocery or home supply store can work, but sometimes they actually attract more ants to them and therefore don’t work nearly as efficiently as a pest control company like, say, Economy Pest Control, for example. Did you know that ants can carry, but are seldomly involved in transmission of, diseases on their little feet, diseases just like cockroaches and other pests? Some ants can even sting or bite. And no matter what, when they come in hundreds, they are destructive and can damage food and property. With our ant treatment program, we’ll take care of the nuisance and there shall be no more marching; plus, we will run preventative measures to ensure those ants stay outside and return to the hill from whence they came! 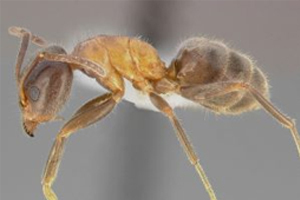 These little guys are the most common household ant pest in the U.S. They have an incredible sweet tooth and love to nest indoors under sinks, mats and appliances. Outside, odorous house ants will hide under trashcans, plant pots and rocks. They love to eat dead insects and spiders, but again, their favorite thing is anything sweet. If you ever happen to squish one of these brown or blackish ants, they actually do have an odor, much like bleu cheese. Some people say they smell like rotten coconut, though! Either way, the odor is a defense mechanism against their predators, and when they are under attack, they spray and scatter. Odorous house ants live in colonies with workers and queens. They like to nest near warm areas, water sources or in insulation. When it comes to these ants, it’s best to call us right away, as velvety tree ants can be aggressive in nature. Like the odorous house ant, velvety tree ants also emit an unpleasant odor when they are on the defense. They love to eat sweets, and they can nest in moist areas, but love trees a lot. Velvety tree ants are known to climb in to homes through a branch of a tree that touches the home. These guys bite, so beware! Carpenter ants are just as their name suggests: they are carpenters, and they love digging in wood. Carpenter ants can grow to be more than an inch long, they are black in color and are nocturnal (sneaky guys!). These pests tunnel through rotting wood and soil, and create systems and structures for their homes, which destroys the integrity of the material they are digging through. This includes windowsills, wooden decks, roof eaves and more. Their destructive nature can be confused with termites. 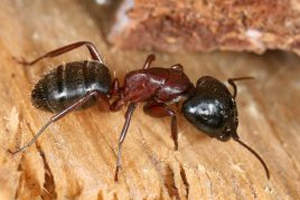 One thing to note is that they don’t stray too far from their nest; a few carpenter ants in the home may not be anything to pick up the phone for, but if there is a stream of them inside, most likely their nest has been developed in your house. That’s the time to call Economy Pest! Argentine ants are difficult to get rid of on your own so it really is necessary for you to call us to help you with this invasive pest. 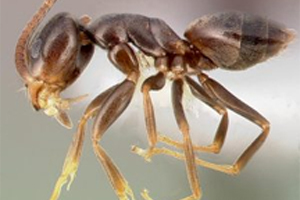 They are perhaps to most invasive ant across the globe. They are brown and territorial; evil even, forcing other ants out of their nests. Argentine ants nest in dark and moist areas just like velvety tree ants. These guys, though, will make themselves a cozy little home inside your house when it’s cold out. They can get in through the tiniest of cracks and love to eat sweets. Argentine ants can bite, and while they aren’t poisonous, their bite can cause burning and itching. 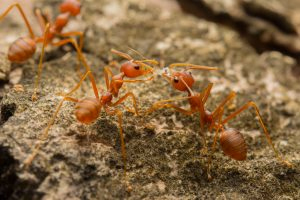 If you do get bit by an Argentine ant, wash the bite area, avoid scratching it, and try an antihistamine or calamine lotion on the area. 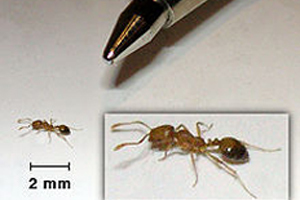 Be on the lookout for these tiny, orangish ants that just love to live indoors. Pharaoh ants make their nests in kitchens, bathrooms and moist, difficult to reach areas. 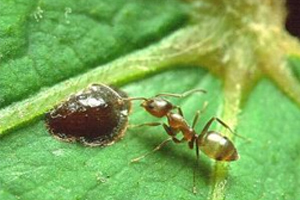 They, unlike their cousin ants, will feed off of most foods, especially greasy and fatty foods. They love pet food dishes as well, and to make it really gross, they love to feed off open wounds on pets and humans and have been known to spread bacteria like staph disease. Pharaoh ants are difficult to get rid of on your own. Economy Pest Control has worked with Pharaoh ant problems for decades and would gladly come to your home or business to control and prevent these nasty pests! Fire ants are named after the feeling you get when one bites you—it’s a burning sting feeling, and fire ants will willingly bite anyone or anything that causes them to feel defensive. Fire ants are reddish-brown in color and nest outdoors. They build their nests in dry ground and you’ll notice their crater-like hills around your yard, with a hole at the top where they enter and exit. Fire ants love to eat sweets as well as greasy and fatty foods, and as a group will feed on small animals and birds (the fire ant sting is poisonous to small animals). If you do get bit by a fire ant, wash the area and try aloe vera or hydrocortisone cream to sooth the burning. If you have an allergic reaction to the fire ant bite, please call or see a medical professional as soon as possible.